As Christmas draws closer, I am again reminded of how my husband, Brian, loved this time of year. A family man at heart, he enjoyed nothing better than bringing us all together to share in the fun and good cheer. This was especially true after our three children, Michelle, Clint and Julie, left home, and our time together was even more precious. Every year, around the middle of December, Brian and I took our Christmas tree out of storage and decorated it together. This never failed to bring on the Christmas spirit and encourage us to join the throng of Christmas shoppers searching for the perfect gift to give to members of their family. No matter how organized Brian and I were with our shopping, wrapping was always left until the last minute, and we would sit up until the wee hours on Christmas Eve, placing our gifts beneath the tree. Lack of sleep never diminished the pleasure we felt when our family came together on Christmas day for the much anticipated giving of gifts. Our two dogs, Ben and Rufus, also received gifts and loved to join in the fun. 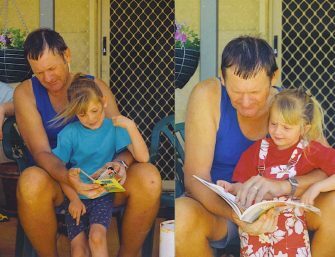 Brian Kember celebrates Christmas Day in 2000 with granddaughters Shannon and Kylie. Though Brian enjoyed this tradition, preparing Christmas dinner gave him the most pleasure. An excellent cook, he planned the menu each year, shopped for the ingredients and spent hours in the kitchen putting everything together. Always keen to try something different, Brian often found new recipes and would follow them to the letter. I was constantly amazed by his patience and attention to detail. No matter what Brian cooked, it looked and tasted amazing, and we usually ate far more than we should have. Not surprisingly, there was not much action in the Kember household on Christmas afternoons, but it was nice to sit around talking about the year gone by and of our plans for the next one. Any plans Brian and I had for the future ended December 1999. Just six days before Christmas, Brian was diagnosed with pleural mesothelioma and given three to nine months to live. The devastating news made it impossible for us to enjoy Christmas. When New Year’s Eve came around, it was the saddest we had ever known. Though we could not have known it then, Brian still had a lot of living to do. By the grace of God, he was still alive 12 months after his prognosis and was once again looking forward to Christmas day. As an added blessing, he was also looking forward to eating his fair share of the Christmas dinner. Thanks to chemotherapy treatment shrinking his tumor, he was again able to swallow solid food. After months of surviving on pureed food, this was a dream come true. In 2000, we held our Christmas morning gift-giving ceremony as usual, but there was nothing usual about this day. After months of fearing Brian would not be with us, his presence was the most precious gift we could have ever asked for. Christmas dinner, once again prepared by Brian, was absolutely delicious. Our enjoyment of it was heightened by the fact that Brian had the pleasure of eating with us. After dinner we invited our friends and neighbors for Christmas drinks and sat talking about everything other than Brian’s illness. It was so nice to forget about cancer for a while and to feel normal. It made the perfect end to a perfect Christmas day for Brian and me. How Many Days Are Left Until Christmas? Despite being on oxygen and needing a wheelchair to get around, Brian helped me to shop for gifts and chose the Christmas dinner menu, even though he was no longer capable of eating it. On Dec. 21, 2001, Brian was unable to leave his bed. I knew his long battle with mesothelioma was coming to an end, and it broke my heart to know that his wish to be with us for Christmas was not to be. But then I had an idea: Why not celebrate Christmas early? The children agreed this was a wonderful idea. We brought the Christmas tree and all the gifts into Brian’s room and sat around his bed so that he could take part in our gift-opening ceremony. 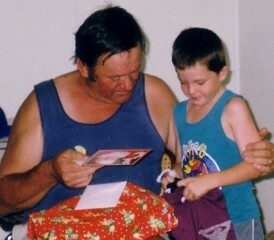 I will never forget the look of joy on his face as he watched us open the precious gifts he had chosen for us. Brian passed away Dec. 24, 2001. Time has eased the pain of my loss, but memories of Brian are forever with me, especially in the festive season. Christmas will never be quite the same without him. I miss this beautiful man and the passion he had for this time of year. I miss the joy he brought to the table with every delicious meal he cooked. It would be so easy for me to give into sadness at this time each year, but I choose not to. Instead, I find joy in the gift of life I am living and the loved ones who share my life with me. I know this is what Brian would have wanted.